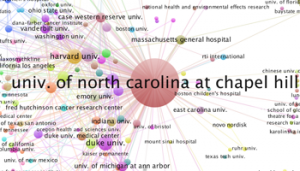 The Research Hub @ The Health Sciences Library partners with the UNC-Chapel Hill community on impact measurement and visualization projects in support of research, education, and clinical care. We maintain the Measure Your Research Impact guide. Throughout the year, we offer a series of Research Hub events and workshops related to data visualization methods and software, and are developing new offerings on impact measurement for 2018. You can learn about upcoming Research Hub events by consulting the Research Hub Events Calendar and/or joining the Research Hub Events Notification listserv. Submit a Request for HSL IMV services. Email us if you have questions about HSL IMV services.